The Gluten Free Photographer: I Love Ice Cream! When the sun comes out, I can't help but use it as an excuse to eat ice cream. So when I woke this morning to sunshine and blue sky, I knew today was going to be no exception. 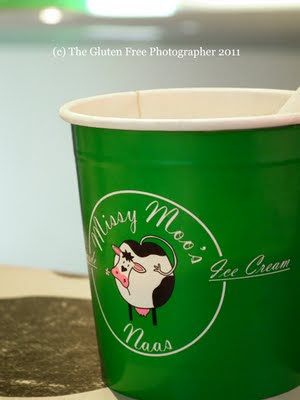 I packed myself and my daughter off to visit the only place to go when the urge for ice cream is on me - Missy Moo's. I love this ice cream parlour. There really is no other place like it in Ireland. It's a family run business located on Chapel Lane in Naas, Co. Kildare. They make all their homemade ice cream upstairs from the shop and is worth the visit. 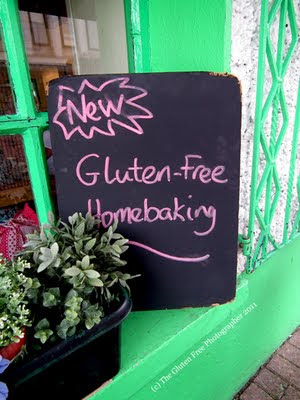 They have recently introduced a new gluten free range of home-baked goodies. There is a lemon drizzle cake and also gluten free cupcakes, with intentions to expand the gluten free menu in the future to possibly include savoury lunch options (ie. sandwiches, etc.) 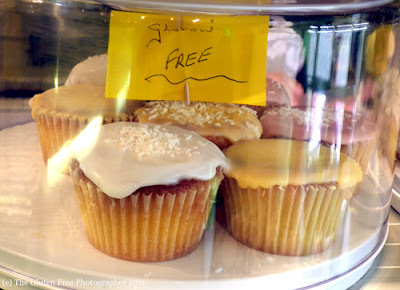 They make sure their fresh gluten free goodies are covered properly and not touching other foods to prevent cross-contamination at the counter. Not forgetting the amazing ice cream! There can be up to 18 different flavours to choose from on any given day; with choices such as Honeycomb, Marshmallow Heaven, Minty Golfball, Chocolate, Vanilla - all the classics. You can have a sundae with homemade caramel or chocolate sauce, whipped cream, a variety of toppings to choose from - nuts, marshmallows, hundreds and thousands (hopefully there will be a gluten free hundreds and thousands option too - I'm told it's being looked into, yay! ), milkshakes of any flavour or made with any bar of chocolate they have available behind the counter, ice cream floats, cones, etc. You can also custom order an ice cream cake from them. There are some ice creams I couldn't have due to their gluten content, such as Birthday Cake and Chocolate Brownie, but there is enough choice I think, to keep everyone happy. You can find Missy Moo's on facebook here: http://www.facebook.com/pages/Missy-Moos/289689587586 and you can also buy their ice cream and their ice cream cakes at Avoca in Rathcoole. They were awarded a Bridgestone Best In Ireland award this year as well as a Best Eatery Award at the Kildare Business Awards, both of which were well and truly deserved. If you haven't guessed already - I'm a Missy Moo's addict and proud to be one! OMG! i wished i was gluten free instead of dairy free after reading this! sounds amazing!